Heifetz on Tour, the National Program of Outreach and Career Development from the Heifetz International Music Institute, today has announced a series of concerts and events taking place in both Washington, DC, and the Shenandoah Valley designed to raise awareness and funds for the Institute’s 20th Anniversary Summer Program, taking place from June 30th to August 11th, 2016, on the campus of Mary Baldwin College in Staunton. 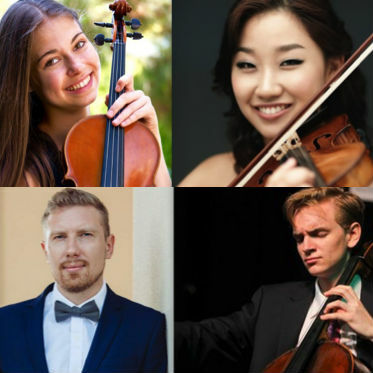 The March tour features four outstanding artists connected to the world-renowned Heifetz Institute: Alumni standouts Yezu Woo, violin; Emma Wernig, viola; Coleman Itzkoff, cello, along with faculty pianist Anton Smirnoff. Both individually and in combinations, the quartet of artists will present a varied and engaging program that will include solo works, by turns soulful and dazzling, and stirring performances of chamber music masterworks by Ludwig van Beethoven and Johannes Brahms. The concert tour will kick off on Thursday, March 17th, at the Kreeger Museum of Art in Washington, DC. The Kreeger was designed in 1963 by Pritzker Prize-winning architect Phillip Johnson to serve simultaneously as a recital hall for music, a gallery, and a private home for arts patrons David Lloyd and Carmen Kreeger. As such, it has become a favorite location for Heifetz Institute musicians to present their “masterpieces among the masterworks.” The concert begins at 7:30 pm, with a reception afterwards to toast the Institute’s 20th Anniversary Year. The Tour will conclude with an intimate Sunday afternoon benefit concert and reception at the Temple House of Israel in downtown Staunton. This historic Moorish Revival building designed by Sam Collins of noted Staunton architects T.J. Collins and Son, is the site of the free-of-charge “Heifetz At The Temple House” performances every Monday at noon during the summertime run of the Institute. Through this event, both organizations have joined forces in order to keep the summertime performances free and open to all. The Institute’s 2016 Shenandoah Scholarship Campaign is a matching-grant initiative to raise $200,000 in scholarship funds to bring students to Staunton, VA for the Institute’s 20th anniversary summer program. The Heifetz Institute Board of Directors has agreed to provide an additional $100,000 in scholarship funds if that figure could be matched by local donations. As of February 29th, the Institute has raised $73,525 towards this $100,000 goal.